Once upon a time, in the early days of Hearthstone, Tinkmaster Overspark was a superstar. The Classic set legendary minion that nowadays is a three-cost 3/3 with a battlecry to transform another random minion into a 5/5 Devilsaur or a 1/1 Squirrel (at random) used to have a 2/2 statline but the battlecry effect was targetable. As such, it was generally a superior form of silence. Then, on 11 March 2014, Tinkmaster Overspark was nerfed to oblivion, or so we all thought. I was actually one of the many players who disenchanted their Tinkmaster Overspark, as it was no longer worth running over a simple silence effect. 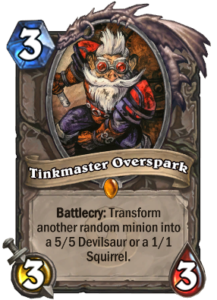 However, times change, and with the nuances of the Standard format becoming more clear, Tinkmaster Overspark has already seen a slight return back to the metagame and there is every reason to believe that this gnome will see more play in the near future.